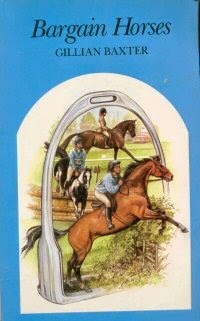 Bargain Horses (1992) is the last pony book Gillian Baxter wrote. It was published as part of J A Allen's Junior Equestrian fiction series, and is an excellent read (and when I checked, secondhand copies are available in the UK fairly readily, and for a reasonable price). The parents, or at least responsible adults, in Gillian Baxter's stories don't always get a good press. Perhaps worse of them is Bobby's hideous aunt, Helen, who buys Bobby's mare Shelta, and mistreats her, but she's given a run for her money by the mother in Bargain Horses, Mary Conway. It's not horses Mary mistreats: it's her daughter. In Bargain Horses we see what happens when an adult's ambitions are more important to them than their family. Mary thinks she's a brilliant trainer, but the rest of the world doesn't agree. Mary has no money, and so the horses she finds to train are all bargains. They're bargains for a reason, because no sane person would ride them. But that's alright, because Mary has her daughter, Gemma, to ride the procession of equines who are mad, bad and downright dangerous to know. Gemma thinks she's seen the worst the equine world has to offer until the day when her mother buys Weston.